The Dolphin Swim Adventure at Playa del Carmen Maroma is an exceptional opportunity to have a truly personal encounter with dolphins. Participants in this program will not only swim with dolphins, but also kiss, hug, and shake hands with these amazing marine mammals. Participants will even receive a famous dolphin belly ride. The Dolphin Swim Adventure at Playa del Carmen provides an exceptionally personal experience with dolphins. These incredible marine mammals have always intrigued, inspired, and captivated people from first sight. At Dolphin Discovery Playa del Carmen at the Mayan Riviera, the Dolphin Swim Adventure will give you the opportunity to meet, greet, and touch these unique and interesting creatures. During the Dolphin Swim Adventure, you'll have the chance to get to know dolphins in the largest habitat in the Mayan Riviera, at one of the best beaches in the world. You will not only experience a personal interaction with the dolphins, but also have a real educational opportunity. Tour participants will learn about dolphin activities, behaviors, and diet. Tour participants will enjoy the unique opportunity for close physical contact with the dolphins. The Dolphin Swim Adventure includes the famous belly ride, in which you hold on to the dolphin's fins as the marine mammal swims backwards. You will also enjoy the chance to play, kiss, and hug a dolphin. Your tour also includes a boogie push. During the boogie push you will be laying on a boogie board and the dolphins will push you as you ride along. You will learn what how dolphins sing and dance in the water. The tour includes 40-minutes swimming and playing with the dolphins, following a 15-minute introductory presentation. It also includes the use of lockers and showers, and transportation to and from from your local hotel. 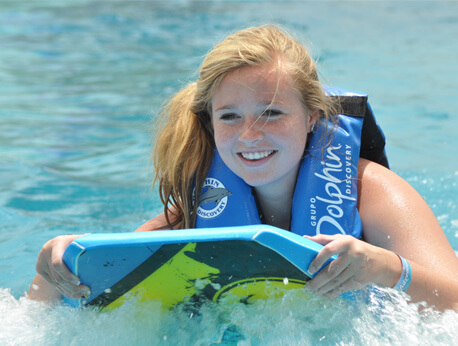 The Dolphin Swim Adventure has excellent customer reviews that rave about the experience. The dolphins at our habitat are friendly and playful; they enjoy interacting with tour participants of all ages. Groups participating in the Dolphin Swim Experience include a maximum of 12 people to ensure that all participants get a close and personal experience with these engaging, lively marine mammals. The Dolphin Swim Adventure is open for kids ages 6-12, and adults 13 and up; for infants, please call Dolphin Discovery. Kids under 10 must swim along with a paying adult for a great family activity; kids 10 and over may swim alone by paying the adult price. The Dolphin Swim Experience happens five times a day, every day.